Kia's Niro Hybrid Utility Vehicle is revving up for its world debut at the 2016 Chicago Auto Show taking place in February. In anticipation of its official unveiling, Kia has released the first images of the Niro HUV displaying its sporty and versatile design. With the Niro HUV, Kia is offering consumers a low-emissions compact SUV. "Our new model is designed to offer buyers everything they could want from a compact SUV in terms of practicality and styling, while providing the typically low running costs associated with a dedicated hybrid powertrain," said Hyoung-Keun Lee, Vice Chairman and CEO of Kia Motors. The Kia Niro HUV comes with a new and modern design. The sporty hybrid has a sleek and aerodynamic body with sculpted surfaces. It will also be instantly recognizable as a Kia vehicle due to its signature "tiger-nose" front grille, among other Kia design cues. The Niro HUV also maintains the practical SUV shape. It has a wide stance and a low center of gravity. There is also a long wheelbase that will provide passengers with spacious interiors. As part of Kia's initiative to create a greener car line-up by 2020, the company developed a new eco-car platform that will first be seen in the Niro Hybrid. The new platform uses environmentally-conscious technologies as well as next-generation powertrains. With more than 50 percent of the chassis made from ultra-high strength steel, the Niro will be strong but lightweight. The chassis also reduces noise and vibrations, which helps deliver a smooth and quiet ride. To deliver strong crash safety performance, Kia will also equip the Niro with the latest and most advanced safety features. The Kia Niro Hybrid features a downsized gasoline-electric hybrid powertrain. It gets its power from a 1.6-liter Kappa petrol direct injected engine (105 horsepower and 108 lb-ft of torque), a 1.56 kWh lithium-polymer battery pack and a 32 kW electric motor. The powertrain will be mated with a six-speed double-clutch transmission. According to Kia, the Niro will offer greater fuel economy compared to its rivals. It also has an expected 90 g/km CO2 emissions rating. 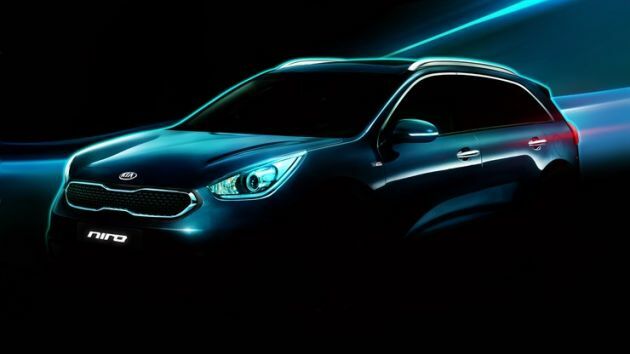 Production on the Kia Niro HUV is expected to start by late 2016. Its official release date will be announced at a later date. Kia is also planning to introduce a plug-in hybrid version to the line-up in the future.